The population of London hit 8.8 million people this year and every one of them is breathing dangerous levels of polluted, toxic air. Every district of the UK’s capital city exceeds safe levels for the most dangerous type of air pollutants. A report by the city’s administrative body, the Greater London Authority (GLA), reveals that over the course of a year London failed to keep below the World Health Organisation’s (WHO) recommended safe limit of 10 micrograms of pollutants per cubic metre of air (10 µg m-3). Pollutants were measured as particulate matter (PM) – the term used to describe condensed solid or liquid particles suspended in the atmosphere. These particles come from vehicle exhausts, construction site dust, and smoke from open fires. PM tends to be classified into those particles measuring 2.5 microns or less in diameter, and particles with a diameter of 10 microns or less. The smaller PM2.5 particles pose a greater health risk, as they can travel more deeply into the lungs and do more harm. Exposure to air with high concentrations of PM2.5 increases the risk of stroke, heart disease, lung cancer, and chronic and acute respiratory diseases, including asthma. The WHO estimates that globally, 7 million deaths per year are caused by air pollution. While there is no safe level of PM2.5, the WHO sets a recommended “safe” limit of 10 microgrammes per cubic metre of air, as infant mortality rates increase above this level. While 95% of Londoners currently live in areas with air pollution more than 50% above the recommended WHO limit, the GLA says London is on track to meet its target of bringing air pollution down to safe levels by 2030. The introduction of congestion charges and air pollution zones restricting the movement of the most polluting vehicles has helped bring down pollution in the city. The UK is now planning to halt the production of new petrol and diesel cars from 2040 which should help further improve air quality. London has come a long way from the days when it was known as “The Big Smoke” and was one of the most polluted cities on earth. 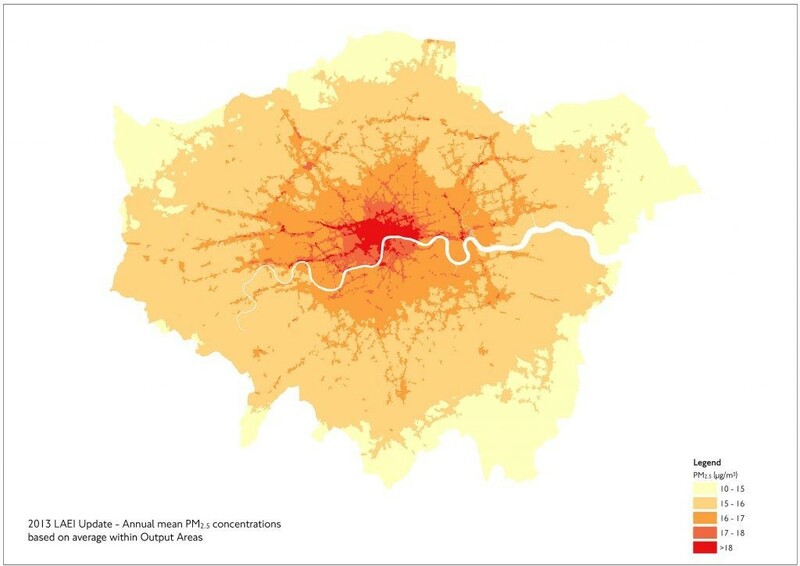 At the peak of the industrial revolution, air pollution in the UK capital reached a lung-clogging 624µg m-3. As the chart above shows, air pollution in London today is far below that of one of the world’s most polluted cities, Delhi. The Indian capital is the world’s 11th most polluted city, with a PM2.5 concentration of 112µg m-3, according to the latest WHO data. India is home to two of top three most polluted cities in the world: Allahabad, with 170µg m-3 and Gwalior, with 176µg m-3. The unwelcome title of the world’s most polluted city falls to Zabol in south-eastern Iran, with a PM2.5 concentration of 217µg m-3. Its extreme pollution is believed to be caused by dust being carried by atmospheric circulation, as well as the desertification of lagoons in Iraq and the strong winds from the deserts of Saudi Arabia sending blankets of dust to Iranian cities. While London may have far cleaner air than the world’s most polluted cities, its average PM2.5 concentration of 15µg m-3 is still some way behind some of the world’s cleanest cities. WHO data shows that many of its European neighbours have cleaner air, including: Dublin with a PM2.5 concentration of 11µg m-3; Madrid with 10µg m-3; and Stockholm with 8µg m-3. Globally many cities are now comfortably below the WHO safe limit of 10µg m-3, including: New York (9µg m-3); Toronto (8µg m-3); Sydney (8µg m-3); and Auckland (6µg m-3). The title of world’s cleanest city falls to the US town of Sinclair, Wyoming, which has a PM2.5 concentration of just 3µg m-3, largely thanks to it having a low population of just 433 people. The US is ranked by the WHO as the country with the cleanest air, thanks to 274 of its cities having air with Pm2.5 concentration of 10µg m-3 or less.